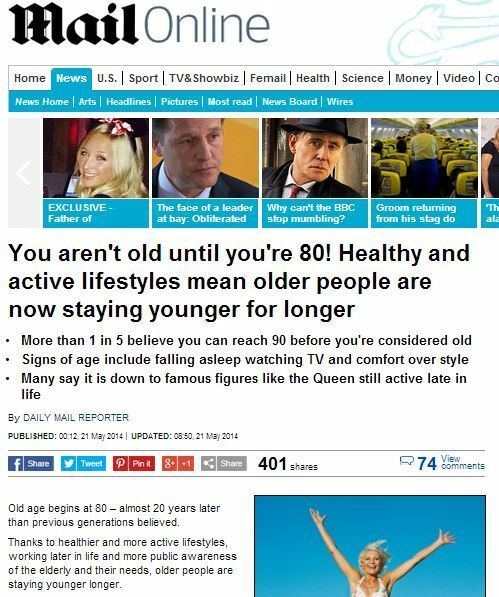 OLD age does not now start until the age of 80, according to a poll. The research among people over 40 found that the vast majority of them will not consider themselves to be old until they reach the landmark birthday. 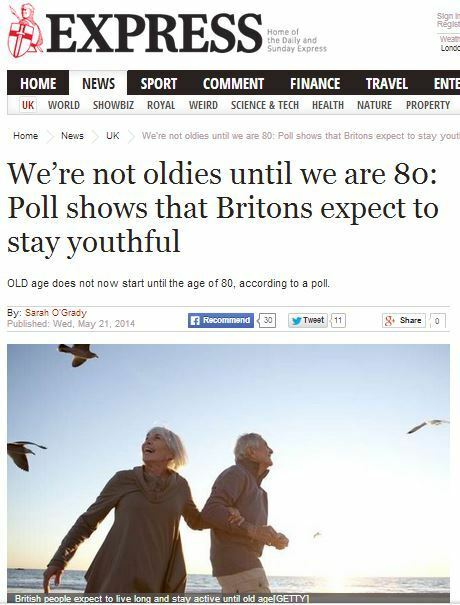 In contrast, previous generations thought of themselves as old at least 20 years earlier. Healthier and more active lifestyles, staying in work longer and seeing more older people in the spotlight are among reasons for the change in attitude. Old age begins at 80 – almost 20 years later than previous generations believed. Thanks to healthier and more active lifestyles, working later in life and more public awareness of the elderly and their needs, older people are staying younger longer. More than one in five Britons even believe you can reach 90 before you are considered old, a study of 2,000 over-40s says. A spokesman for PayingTooMuch.com, which commissioned the research, said: “Perceptions of old age have changed a lot over the last few years. “There was a time when you were considered old or past it as soon as you retired. Now, what should you do with that newfound lease of life? Maybe you should make sure you aren’t paying too much for your life insurance, whaddyasay? “People are also working later in life than ever before. And even if they don’t feel particularly young or fit, it adds to the illusion that they are still young. ‘But while you might not be ‘old’ until much later in life now, it’s important not to put off decisions regarding retirement or later years such as life insurance, wills or pensions. This entry was posted in Uncategorized and tagged 72 point, daily express, daily mail, daily mail reporter, onepoll, PAYINGTOOMUCH.COM, Sarah O'Grady on June 1, 2014 by Michael Marshall.